Update 12/4/17: Positivity has officially launched in the Oculus store. Download the first brain-computer interface for mobile VR today. People frequently ask me that question when we demo our Positivity app, which works with a brain-computer interface, a mobile phone and a VR headset. Only when I gently startle the user and they see the waves jump do they understand that their mind is indeed controlling the immersive story. The soon-to-be-released app will be the first brain-computer interface title for GearVR, with the experience being driven by the user’s own asymmetrical gamma activity. As our interactions on social media become more negative, this new VR title is an attempt to become more self-aware of the power of positivity. BCI or brain-computer interfaces are not new. A UCLA professor coined the term in a research paper way back in the ’70s. However, just like with VR headsets, the new lower form factor, ease of use and portability of these devices that use EEG are enabling content creators like us to harness brain power to drive immersive experiences. It used to be a brain-computer interface required messy gels, lots of sensors over your scalp and a technician to set it up. 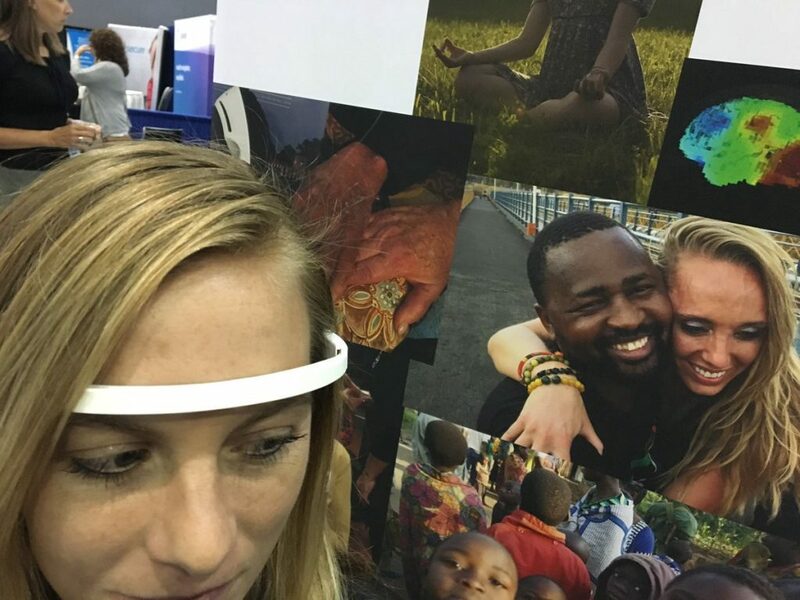 Now an EEG strip attached to a headband is enabling users to navigate media with their minds. 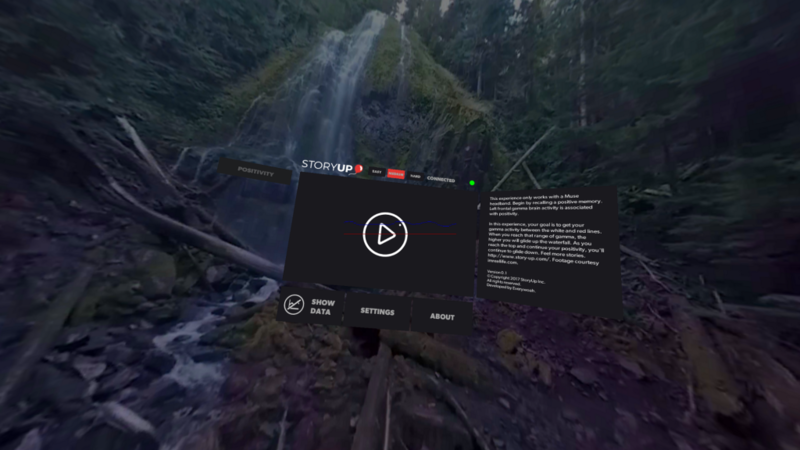 The Positivity BCI project (a collaboration with the Neuromeditation Institute, Everywoah, Immersion.reallife and StoryUP) will be the first mobile VR experience powered by a Muse meditation headband. As the user watches their pattern move across the screen while wearing the headband, it’s as if they’re seeing their neurological reflection for the first time. They aren’t just watching the experience. In a way, they’re feeling it. Even with diagnostic EEG at a hospital, rarely do you get the opportunity to watch your brainwaves react in real-time. In a VR headset, it’s mesmerizing. In Positivity, we utilize the viewer’s asymmetrical gamma activity to drive the experience. When their asymmetrical gamma activity reaches a certain level, they’ll float higher up the side of a beautiful waterfall. Even though this is the first BCI experience for the GearVR platform, we’ve been studying how our experiences actually affect peoples’ brains for quite some time. And in three pilot studies, some of our experiences quieted brain regions associated with the stress response in as little as four minutes. We actually categorize our library of experiences by feelings–all of the content on our platform is meant to elicit positivity, empathy or motivation to reduce situational, occupational or workplace stress. Our Positivity app is meant to be a self awareness tool that our thoughts and feelings not only control things in the virtual world, but the real world as well. At F8, Facebook announced that it had built a brain mouse that can type 60 words per minute with someone’s thoughts. Companies are already working on neuro-computing operating systems that will allow you to navigate hands free right or left, click on media, or even scroll with your brainwaves. Soon, more VR headsets will have brainwave sensors baked into the face masks for the user to control the experience with their thoughts. 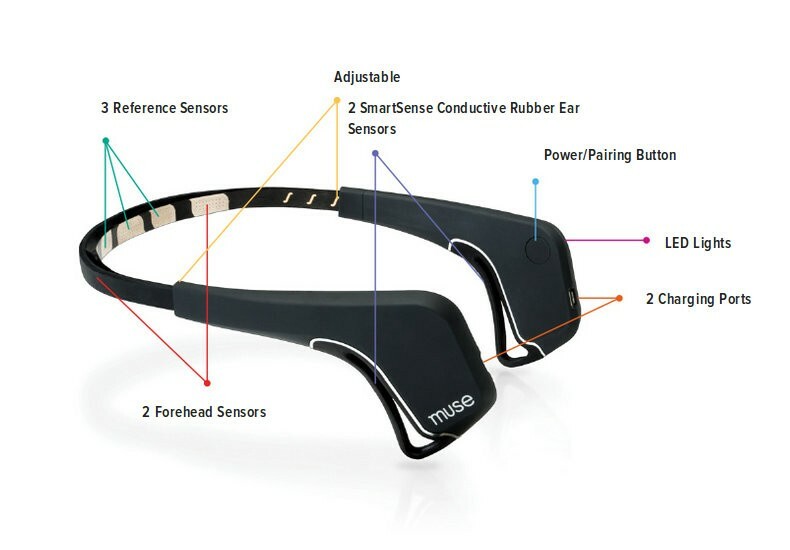 Mind Maze is already advertising its headsets with built in sensors. Looxi Labs is already building a neural-analytics platform. Vive earlier this year announced a partnership with Neurable and released the first VR game to work with a BCI. 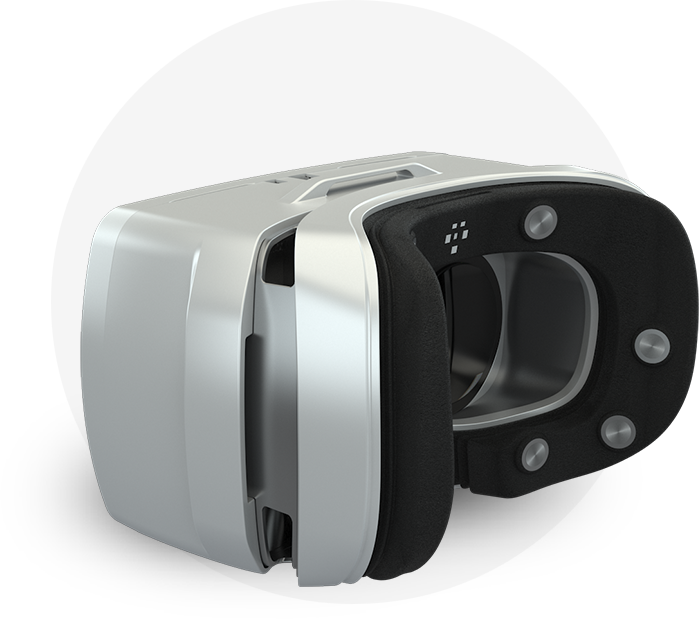 The Mill released Strata this summer which works with an Oculus Rift and the user’s biometrics, including heart rate. Although this setupA camera position for a given scene. You might shoot more than one shot from a single set-up (wide shot and close-up). requires a gaming PC and, for now, a tethered connection, more and more neuro-media experiences like Positivity will be coming to mobile and standalone VR headsets. We’re excited to test drive all the different hardware with our brain-powered stories! But, in the meantime, Positivity will become available for the GearVR platform (for use alongside a Muse headband) within the next few weeks. This post originally appeared on StoryUP CEO Sarah Hill’s Medium account and has been reproduced here with her kind permission. P.S. If you have an extra VR headset, please consider spreading your own positivity by sharing your VR headset with an aging Veteran and donating to your local Honor Flight hub. Currently, there are +100 aging Veterans on a waiting list to virtually visit their memorials. Sarah Hill is the chief storyteller and founder of StoryUP XR. She has 25 years of experience in the media business creating tech-infused stories.